Anxiety disorders are among the most common mental health problems experienced by people living in the UK. Although it is normal for everyone to experience anxiety at times in response to stressful or dangerous situations, persistent and excessive anxiety can have serious negative effects on health, impacting the way we lead our daily lives. Conditions like panic, anxiety and Obsessive Compulsive Disorder (OCD) are more common than people think – 1 in 5 people experience anxiety on a daily basis (ONS report, 2013) – and can be managed if treatment is sought early. According to the Centre for Mental Health, problems like anxiety and depression cost the economy around £105 billion a year. 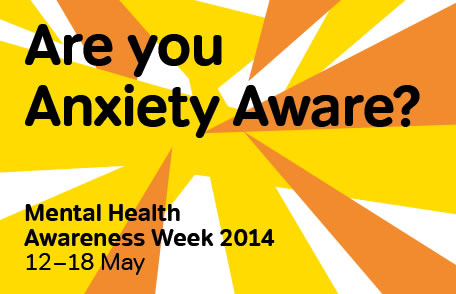 This condition is the focus of Mental Health Awareness Week 2014, which takes place from 12th to 18th May. The week is hosted annually by the Mental Health Foundation, aiming to spread awareness and reduce the stigma associated with mental health issues. As always, the week is marked by the many events held by supporters with people throughout the UK getting involved. If you are planning an event during Mental Health Awareness Week, click here to download a supporter kit from the Mental Health Foundation. There are also easy ways to show your support online and on social media with these handy hints.